Six children and two adults are in hospital with critical or life-threatening injuries after their packed minivan collided head-on with a bus full of teens on a highway near Barrie, Ont. The accident occurred on Highway 26, north of the town of Stayner, on Friday afternoon. OPP investigators have determined the van crossed the centre line and collided with a coach bus carrying students home from a school ski trip. It remains unclear what caused the van to cross the centre line but officials said it was snowing lightly at the time. Clearview Fire Department Chief Colin Shewell said all eight people in the van are in life-threatening condition. The children are between ages four and 15. All have been flown to hospitals in Toronto. The van has Texas licence plates, but police cannot confirm where the occupants are from. Shewell said 41 teens, three adult chaperones and a driver were on the bus and some sustained minor injuries. The teens were students at Hamilton’s St. Thomas More Catholic Secondary School. They were returning home on a chartered bus owned by Attridge Transportation after a trip to the Blue Mountain Resort in Collingwood. The teens were brought to a warming and reception station at the Stayner Arena Hall before another bus arrived to return them to Hamilton. 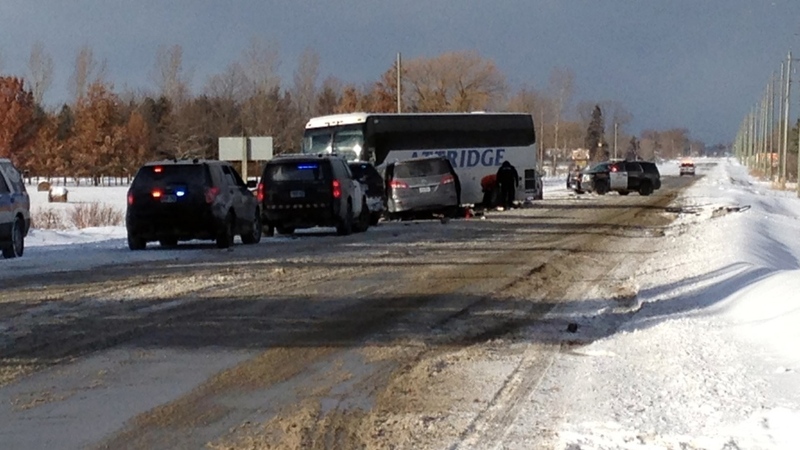 The president of Attridge Transportation told CP24 that he has received information from the driver of the bus. He added that the driver was “pretty shook up” after the crash. St. Thomas More’s principal, Sara Cannon, told CP24 that the students will receive support from the school and school board upon their return. “Our prayers as a school community go out to the occupants of the other vehicle that was involved in the collision,” she added. Police continue to investigate the cause of the crash. A stretch of Highway 26 remains closed.